An interesting new trend is emerging in the wealth management sector in Japan. Not only are there around 7 million baby boomers retiring on fat retirement bonuses between this year and 2010, bringing an estimated ¥40 trillion to ¥50 trillion in to the economy, but also after four bumper years of corporate profits on the back of soaring exports, there is a swathe of newly rich—directors, shareholders, traders, bankers, and professionals supplying high-end services— who are hitting the market as well...So how rich is “rich” in Japan? 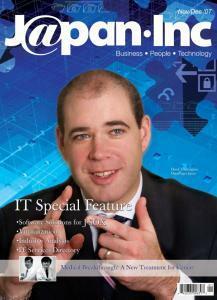 Peter HarrisJ@pan Inc started life as an IT magazine, Computing Japan. After a couple of years it broadened focus to become the wider business publication that it is today. This issue sees us return to our IT roots in the IT special feature, while our new lifestyle section, Culture & Context, breaks into new territory for us. With the Japanese version of Sarbanes- Oxley (J-SOX) only six months away from being a reality that all listed companies in Japan will have to deal with, our cover story focuses on how the right software solution can provide the necessary visibility for top level executives to assess their internal controls. “It’s not that I’m deliberately trying to shock people all the time. I’m just doing things that are obvious to me. It’s because the public doesn’t understand my way of thinking that they get surprised.” These are the words of Livedoor’s infamous CEO Takafumi Horie, spoken during a CNN interview back in November 2005. Although there is a fair case to be made that compared to other Japanese scandal-tainted business people such as Murakami, Horie was no worse, clearly Japanese consumers need more protection from ‘surprises’ in the future. When virtualization leader Vmware went public on August 14, it was the biggest IPO since Google listed in 2004. The company is valued at US$20 billion and the forecasted sales for this year alone are over US$1 billion. Their customers include 100% of Fortune 100 companies and 84% of Fortune 1000 companies. Virtualization is currently revolutionizing the computer industry, but what is it? While troops of IT project managers and engineers are being sent to ‘Death March’—a popular term to describe the brutal working conditions of extreme overtime work, tremendous customer pressure and poor office environments at the frontline of failing projects—the Japanese enterprise IT industry has been failing to cultivate innovation, reward its workers or attract young graduates. Japanese consumers have been slow at catching onto IT trends, with a monopoly from big name brands like Yahoo!, Rakuten, Mixi and YouTube taking places in the top ten most visited sites in Japan. However, slowly but surely, smaller IT companies are hammering their way through, all competing for a slice of the pie. We take a look at the established IT companies’ methods of surviving in a competitive and fluctuating market, plus the up-and-coming companies’ innovative ways of gaining a share of the market. On the night of the Upper House elections, Ichiro Ozawa, president of the Democratic Party of Japan (DPJ) and architect of his party’s election strategy, was nowhere to be found. As the results came in, Naoto Kan, DPJ acting president, and Yukio Hatoyama, DPJ secretary-general, spoke to the press about their party’s victory and excused the absence of the third member of the party’s ruling troika. Perhaps Mr Ozawa was absent due to shock at the scale of his party’s victory.